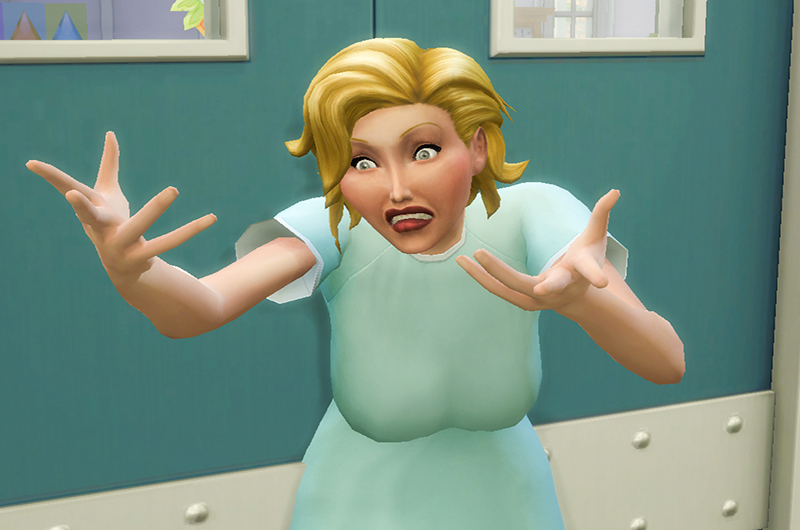 Yes that’s right people, I’ve foolishly decided to undertake my very first Asylum Challenge in the Sims 4! 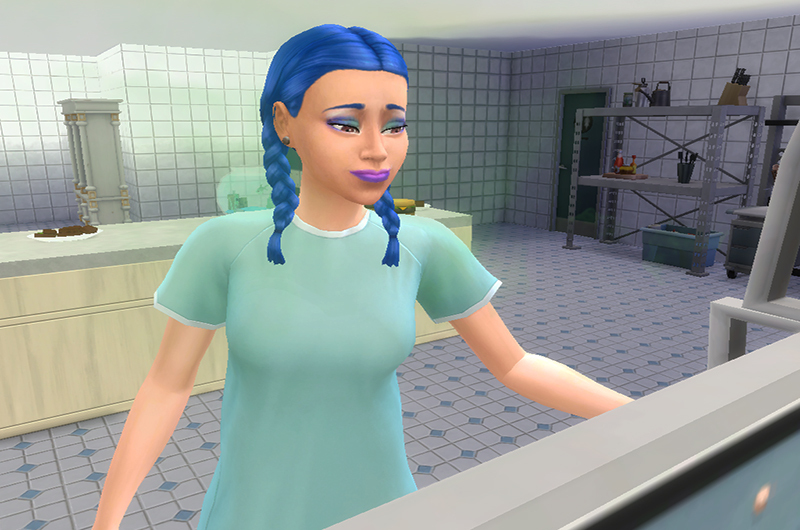 Achieving my chosen Sims lifetime aspiration so they can flee the loony bin doesn’t seem too difficult right? 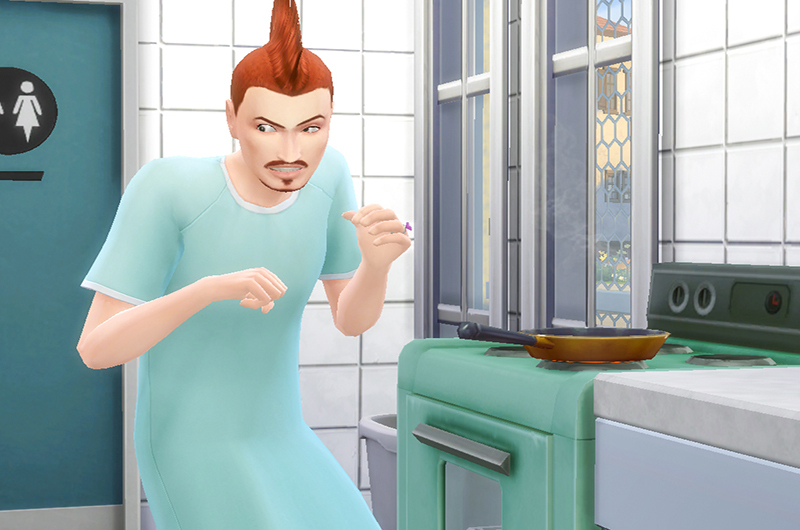 Keeping 7 other Sims that aren’t under my control alive and happy on the other hand, may prove to be very difficult. 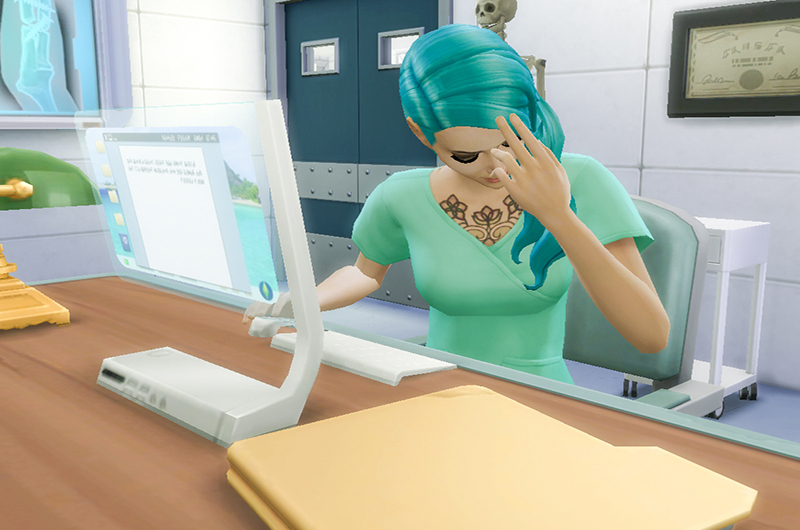 I’m not gonna lie guys, on more than one occasion I’ve left my computer unattended to get food, only to return to find a Sim dead. Considering the budget cutbacks, lack of decent furniture and limited supplies in my Asylum, it’s fair to say this challenge is going to be very interesting. 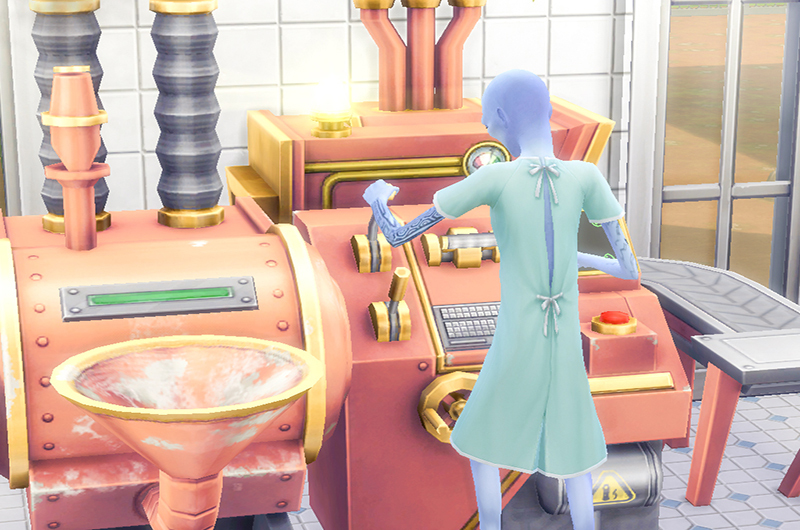 This challenge was originally created by SimScout way back in the Sims 2 days, I won’t go too in-depth into the specifics and restrictions so if you’re unfamiliar with the rules check out the adapted version I’ve posted under the rules tab! 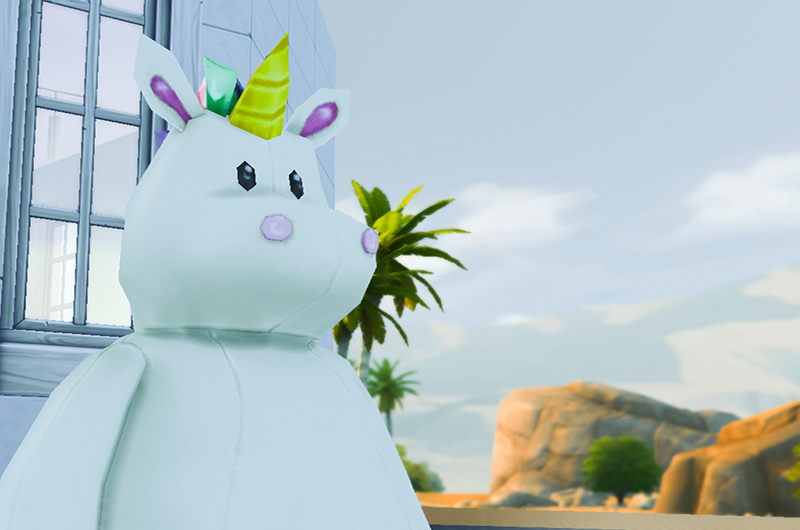 Welcome to the place where all discarded Sims come to vegetate, The Llama Bin located in the beautiful Oasis Springs. 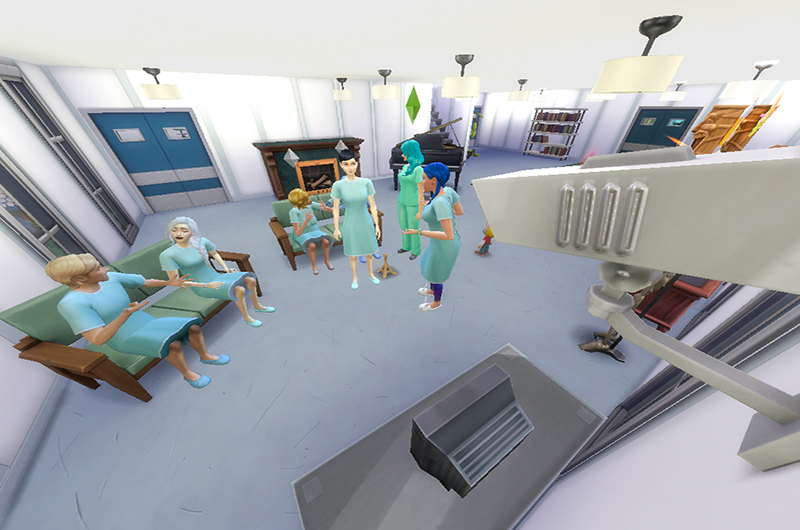 The hospital follows all challenge building restrictions, with limitations such as only 5 beds, 1 toilet, 1 shower, and only the cheapest of appliances. 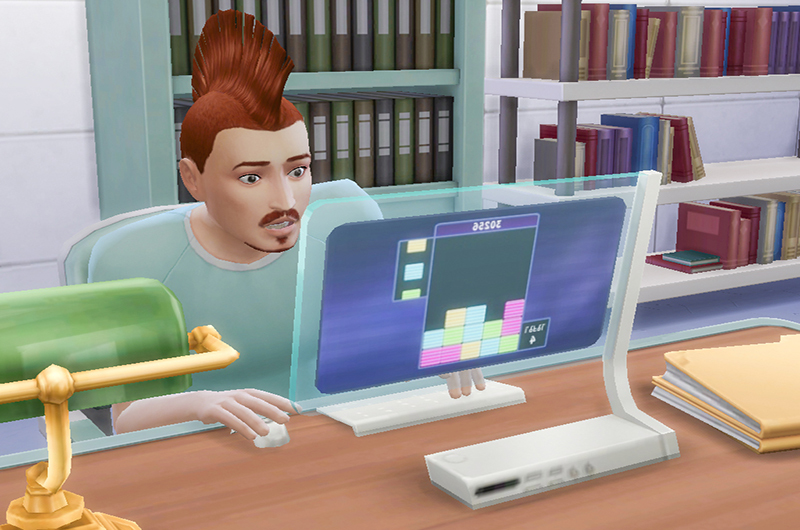 I see a lot of smelly, disgruntled Sims in our future. 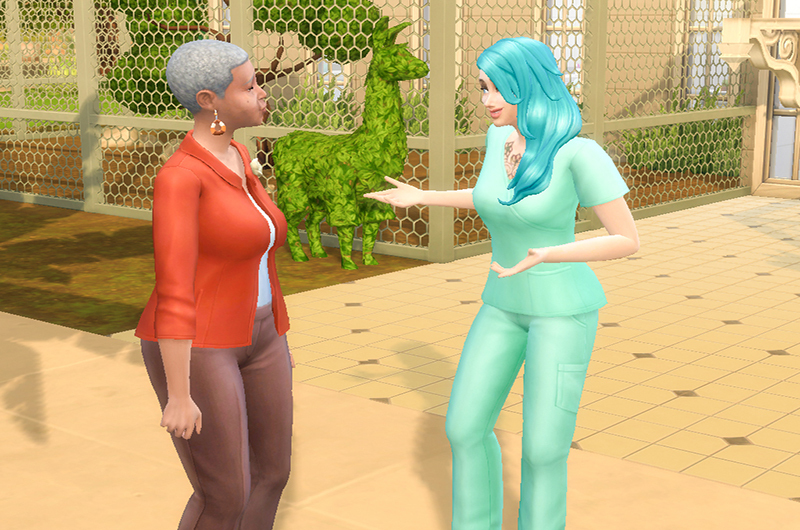 But enough about the rules, let’s get down to meeting our patients. 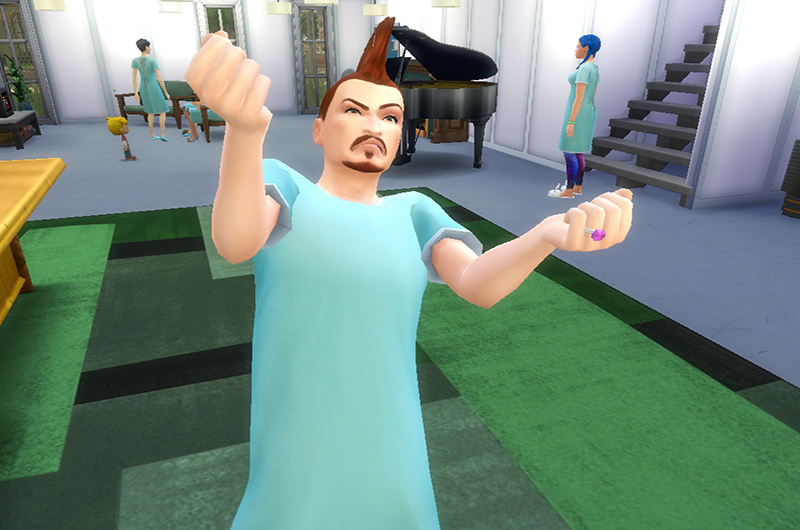 A few weeks ago I asked members of the forums to create for me their best asylum patients, and they bloody delivered. When Tessa was 4 years old she was able to see dead people as the house she was living in was full of old spirits. Her parents took her to a religion-based therapist who diagnosed her as crazy because spirits couldn’t possibly exist. He attributed these visions to the devil invading her body, mind and spirit. 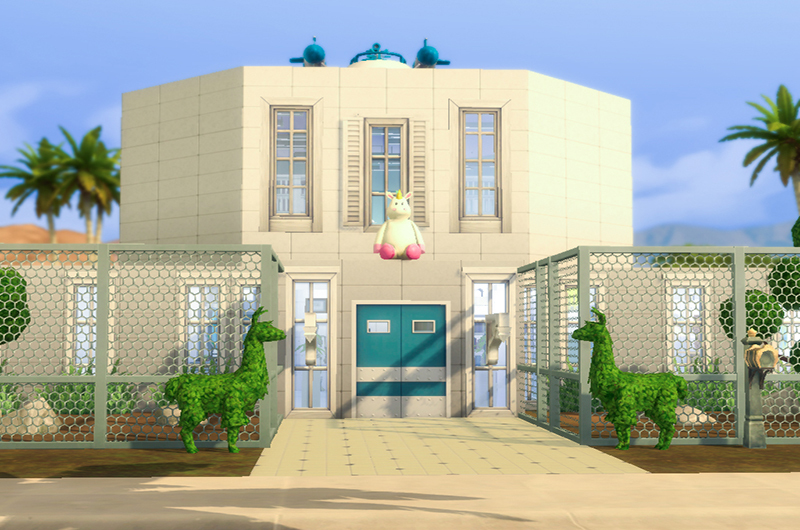 So her parents had her admitted to The Llama Bin where she could continue speaking to her spirits in a safe environment with other crazy lunatics. Creator: KHS12, check out her gallery for some pretty cool creations! 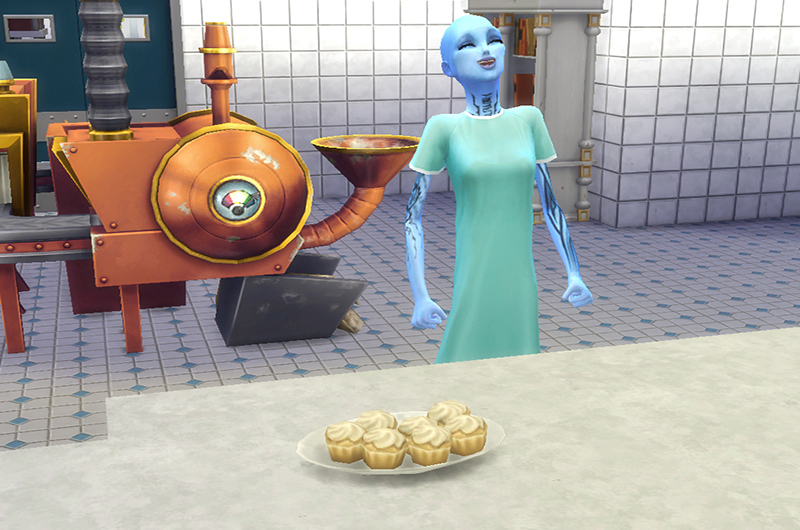 Ever since she was called ugly by her imaginary friend, Cindy has been trying to cosmetically enhance herself. She’s got so much silicone in her that she has to be kept away from sharp pointy objects. 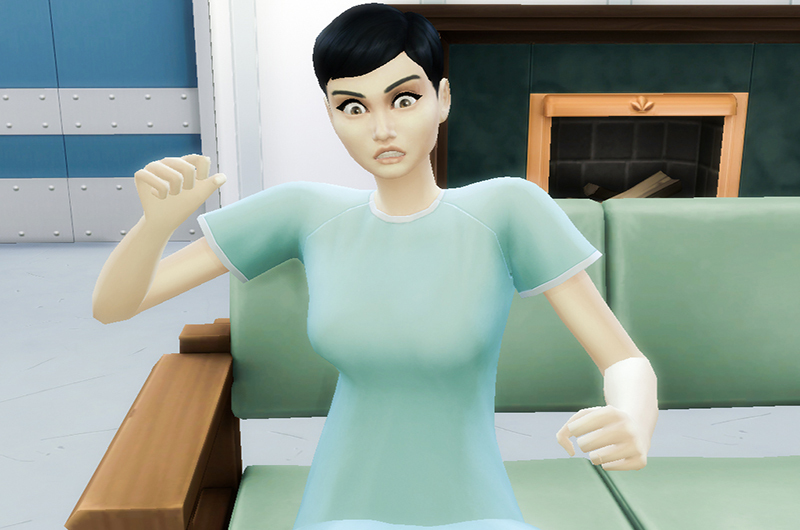 When she demanded more work her plastic surgeon had to refuse, an action that sent her into a psychotic breakdown. 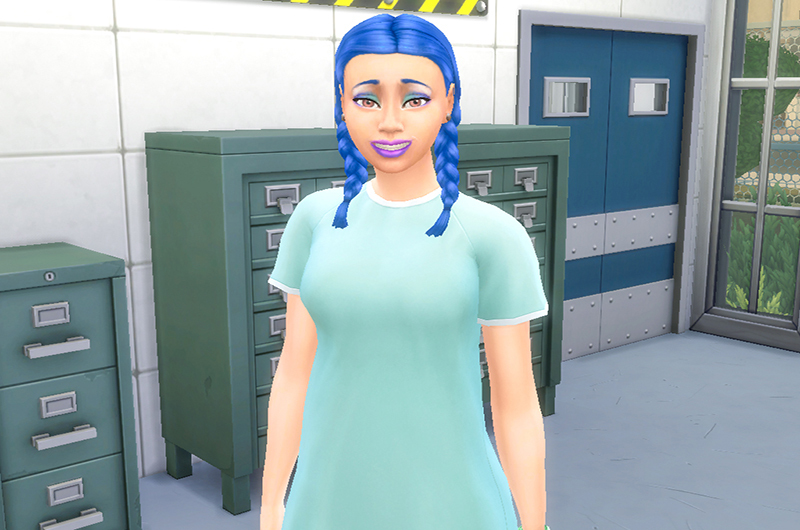 After being caught breaking into his office to steal some breast implants she was taken away to the Asylum for evaluation. Deeming unfit to return to society she has been detained here ever since. Creator: LanzSimmer, who’s account was banned RIP. Despite his charming, romantic personality, Channing Vaugh is not your usual womaniser. As a child he told his friends that he could see ghosts and that if they didn’t play with him these spirits would take their revenge. The other kids continued to torment him, which drove him insane with rage. His mother began to realize something wasn’t right with her son, so she had him committed before he could cause anyone harm. After crash landing on earth, Xonra Delta was captured and taken away to Area 51, a secret military base. There she was interrogated and tortured by secret government officials, who wanted to unearth the secrets of her kind. Eventually she began to loose her mind, and her ramblings became useless to the governments agenda. So they kept her spaceship and transferred her to the local nut house in the hope that with rehabilitation she would become useful again. Melinda Bloom claims to be the princes of a land called Fake Town, and has the power to read minds but it will only work if you tell her what you are thinking. Also known as Comrade Cupcake, she has 458 imaginary friends that live in her eyebrows. 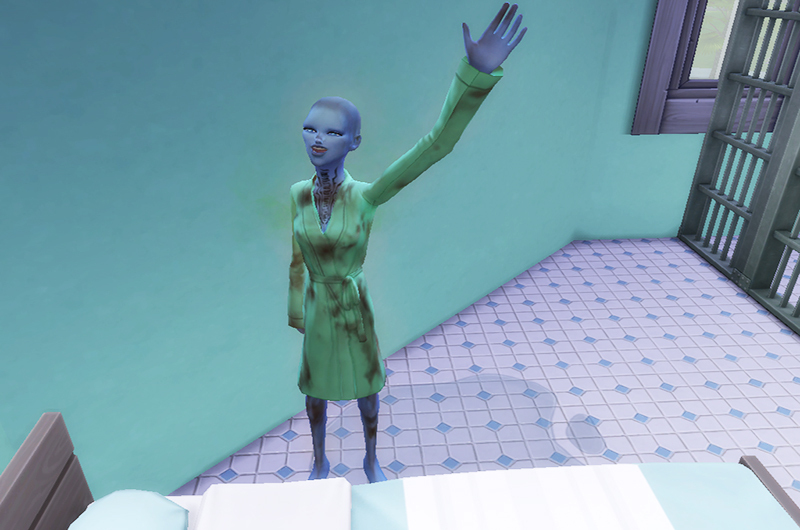 She was found sitting in someones home claiming that it was a park and gave us a business card for a laundromat which is the portal to her city. Raphael likes fire, there’s no two ways about it, he simply can’t help himself. As you can imagine, this is becoming quite a problem, having been expelled from pretty much every school he went to as a teenager. With his parents at their wits end they’ve done the only thing they could think of in order to keep their only son (and themselves) safe – have him committed. Cam Dalton was abducted by aliens when she was 8 years old, and spent weeks being their human test subject. 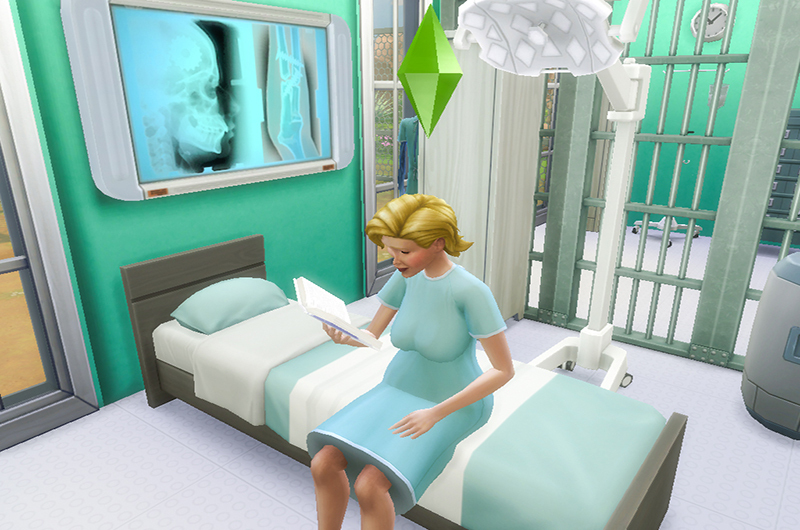 By the time they gathered enough data and dropped her off in her town only 3 hours of Sim time had passed. 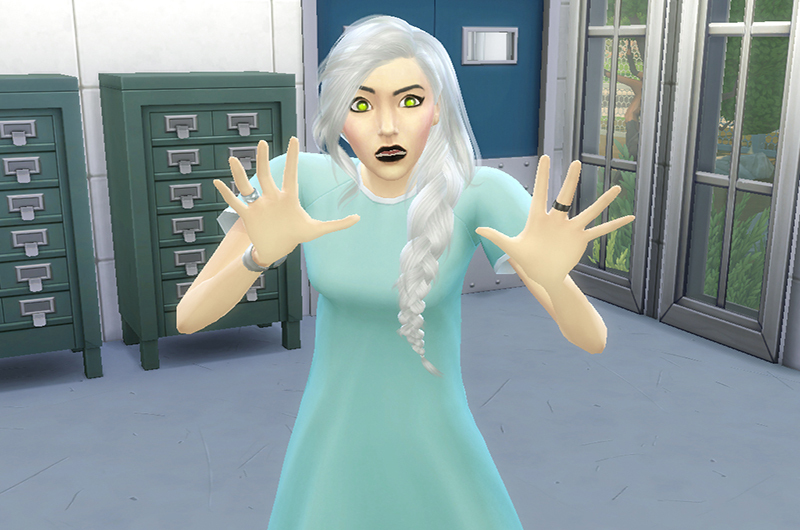 No one believed her story, and she became an outcast, shunned by her peers and even her family for her crazy ramblings. 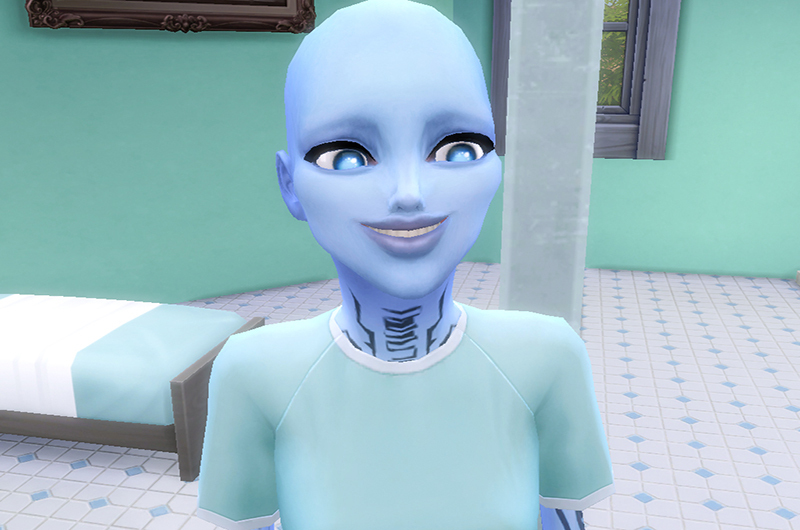 She became so abandoned by society that she wished for the aliens to abduct her again so she could live in space with creatures that understood her. But she never saw one again… until now. And who better to look after these crazies than myself. 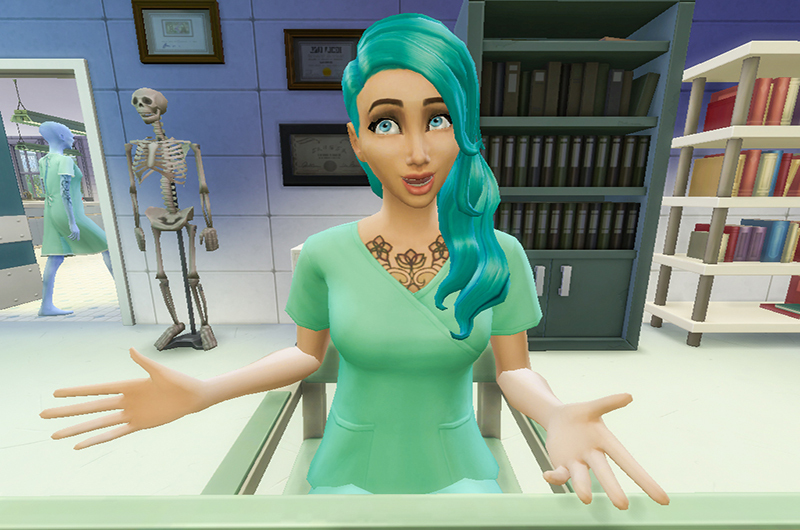 This is Sim me, and yes she does also have a bit of a problem. Well it’s not really a problem, I can stop anytime I want ok. This is really difficult for me to say, but I have been battling a Grand Theft Auto V addiction, I just can’t stop thugging it out in the streets of Los Santos and hustlin with my crew. It is the closest thing a white girl like me can get to being a real life gangster. And fittingly enough the aspiration I rolled was to become a Public Enemy. Now this doesn’t seem too hard given my GTA street cred, but the fact that I’ll also have to keep 7 other insane Sims alive is undeniably going to be disastrous. So let’s get cracking. As you can see the Asylum looks like a really fun place to just hang, as long as you don’t mind the security cameras. The patients are already very keen to get stuck into this challenge (pun intended). Come on now Cam, all patients should be keeping their limbs to themselves, we don’t want any unnecessary law suit’s here. 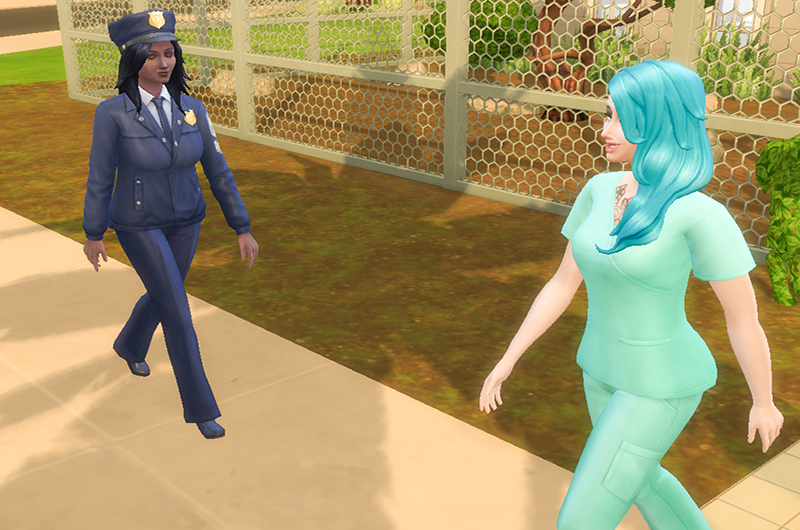 Gobstopped gets herself a job in the criminal career so we can get started on that aspiration ASAP. The success of this entire challenge rests on her shoulders, no pressure or anything. 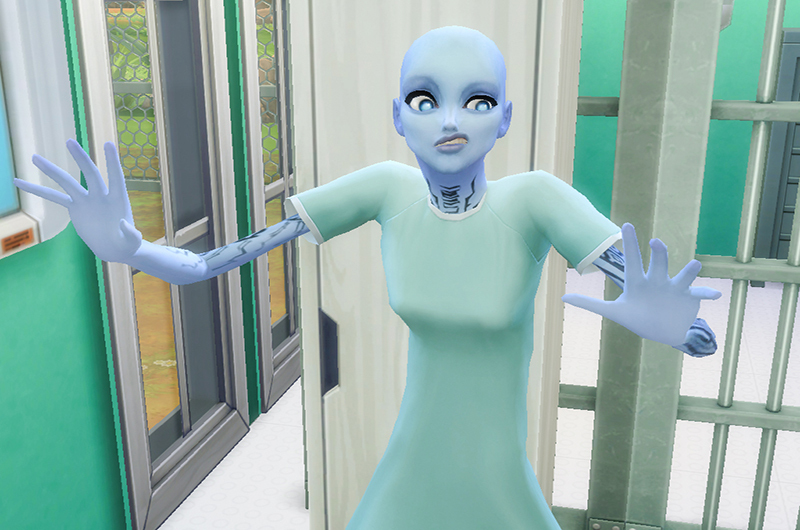 Oh you silly Sims are in for a bit of a shock. Sorry Cindy I’m afraid all that fancy medical equipment is reserved for lobotomies only. 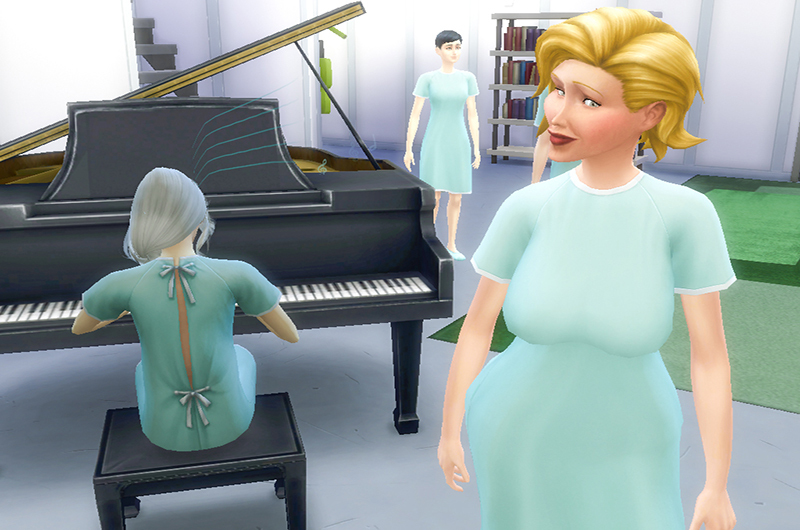 Cindy is not very impressed that Tessa beat her to the piano. 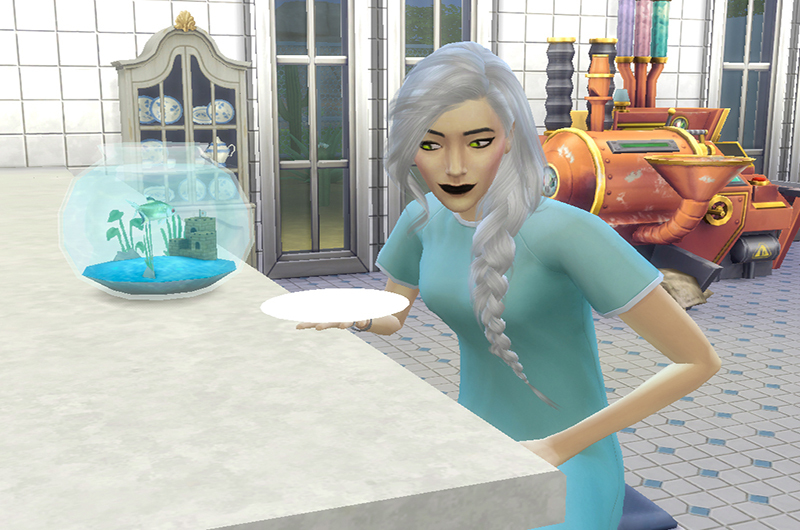 And to be honest, her playing is enough to drive even the sanest Sim up the walls. No Asylum is complete without it’s very own Tiki bar! Ok maybe it’s not entirely necessary but I’ve heard booze is the best treatment for any ailment. It’s like an antiseptic for your insides! Yeah ok Melinda didn’t even get mad after being insulted, she just carried on as usual. That wall of crazy is hard to break through. Unfortunately there is literally nothing stopping you. Riddled with their daily dose of happy pills the cupcakes were a huge hit. Channing ate three! And 5 minutes later suffered the consequences, that icing’s strong stuff. Here at the Asylum, patients can enjoy a goodnight sleep on our rock hard hospital beds, if they’re lucky enough to score one for the night. 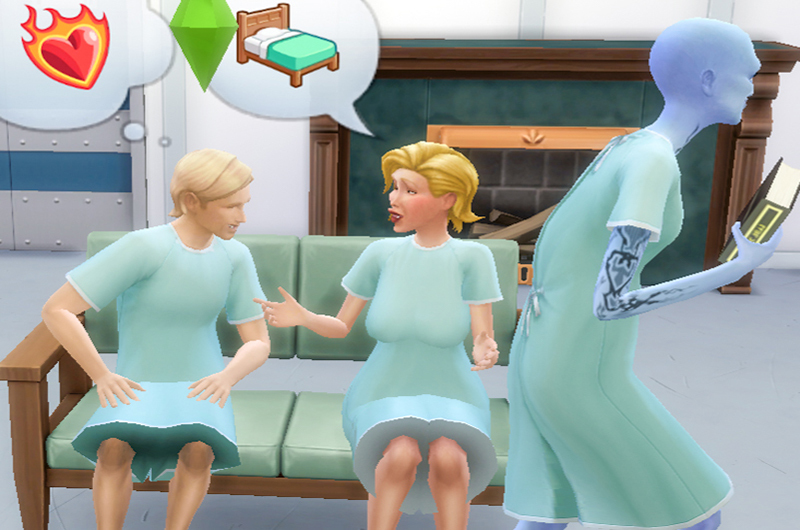 For the other three Sims that were too slow, they’ll get to watch their needs decay until they pass out on the floor. It’s kind of like a fun frat party! 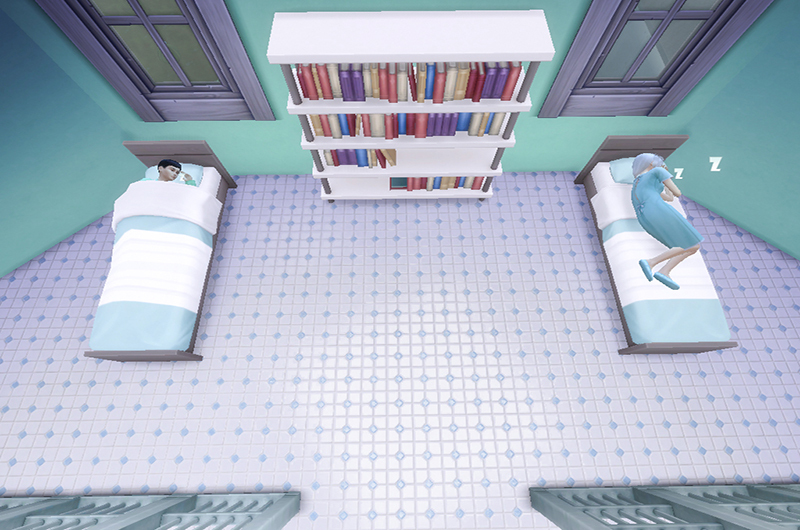 With her first day of work starting the following day, Sim me managed to score a bed. She looks way to happy for someone who’s just been locked in an Asylum against their will. Must be the happy pills I’m sure. 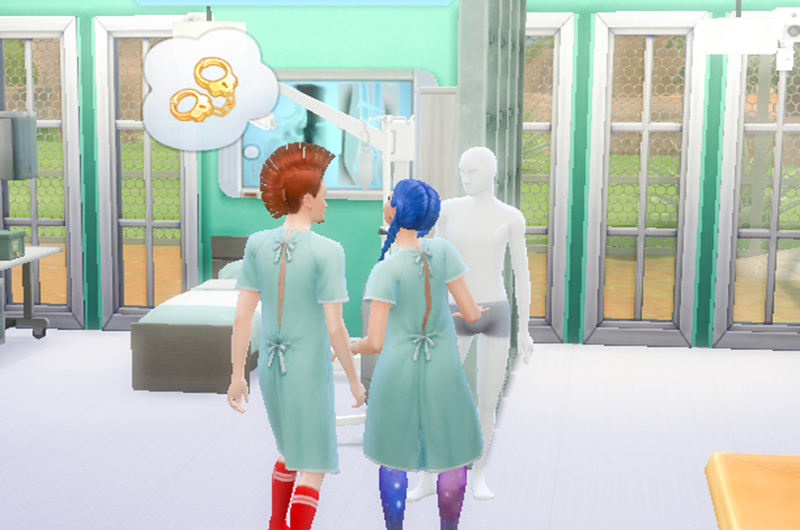 Congratulations to Raphael for being the first Sim to mention handcuffs. I decided it was probably for the best that we take the insults to the streets, as it’s probably not a good idea to make enemy’s with the crazy lunatics you have to live with. 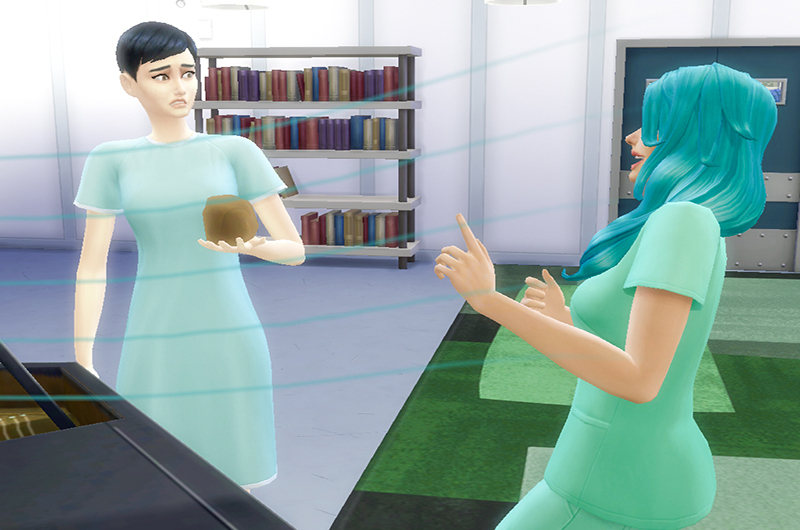 So I got Sim me to go stand in the street and yell at old people instead. She completed those 10 mean comments in no time at all, making this grandma the first of many to dislike her. All in a day’s hard work. 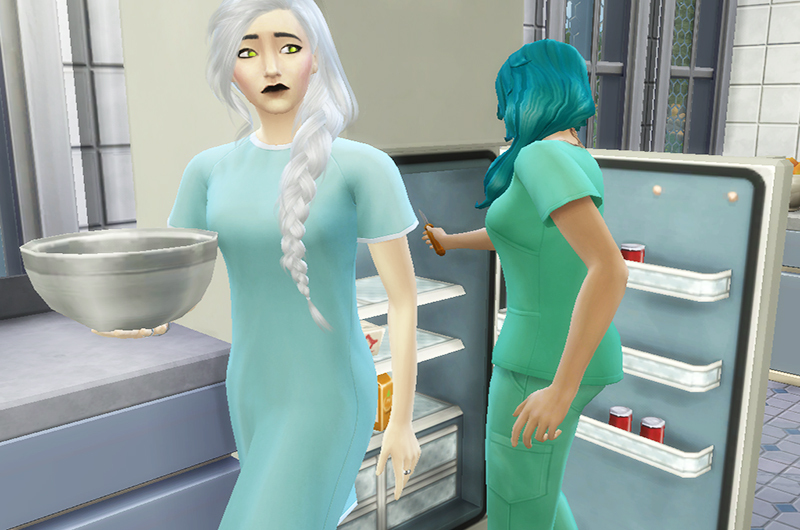 While Sim me is at work trying to score us some cash the Asylum patients are doing what they do best. Absolutely nothing productive. It does beat lighting fires I guess you crazy pyromaniac. Poor Xonra, avert your ears and go read your book somewhere else you innocent thing. Not being able to click on any of these Sims is driving me a little crazy myself. I just want to know what’s going on with them ya know. And it’s so hard to stop them from doing silly things. NO STEP AWAY FROM THE STOVE. 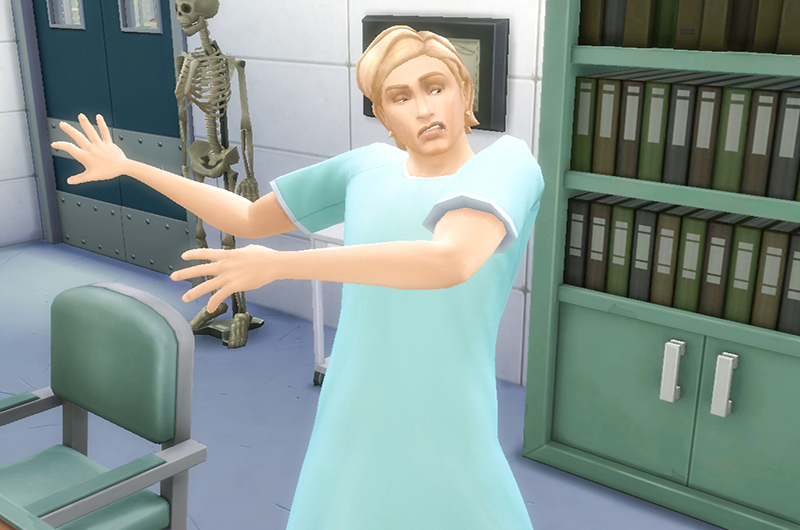 I can’t have any Sim deaths yet surely, not on day two. No joke, this is literally the notification I received today while she was at work. That’s what you get for insulting old ladies in the street I guess. 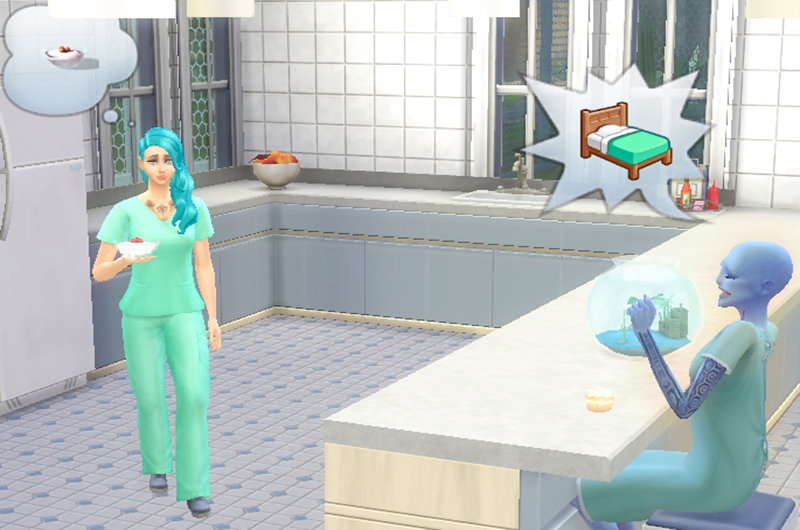 And congratulations to Cindy for being the first Sim to wet herself! And roll around in the dirt… seriously woman what have you been doing with yourself. It wasn’t too much longer till more of the housemates started feeling the wrath of the green stink. This is Asylum living at it’s finest. Only day two and already there’s a mild musty smell in the air. 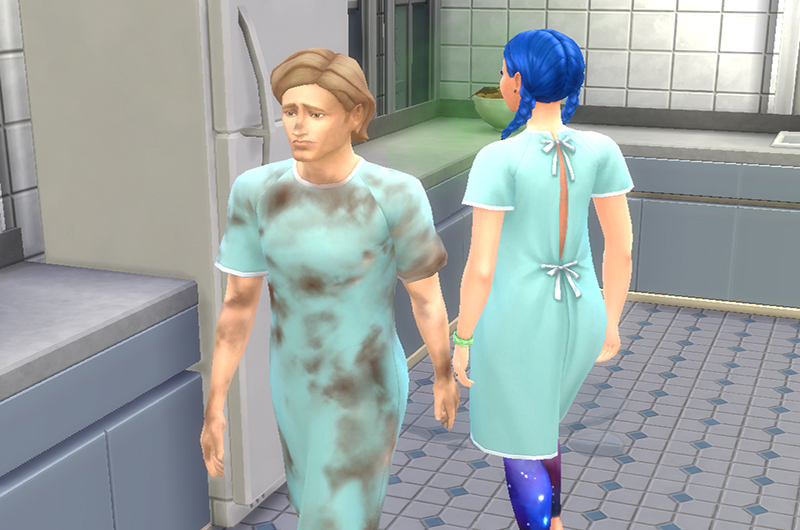 I am so good at playing the Sims that it took me almost a whole day to realise the reason why all of my patients were wetting themselves all over the place and spreading gases everywhere was because both the bathtub and toilet broke. Whoops, my bad guys. And that lucky someone is of course me. 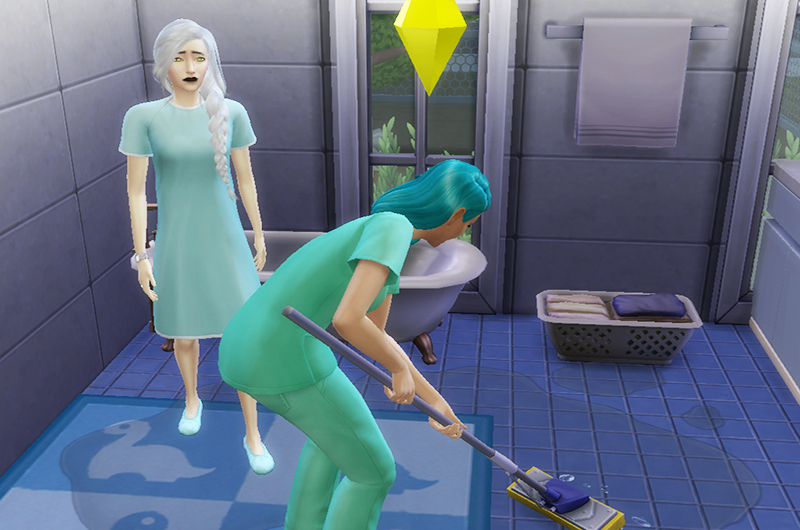 Literally haven’t seen a single one of the other Sims even mop up a puddle or clean a dirty dish. It’s gonna be a tough ride. 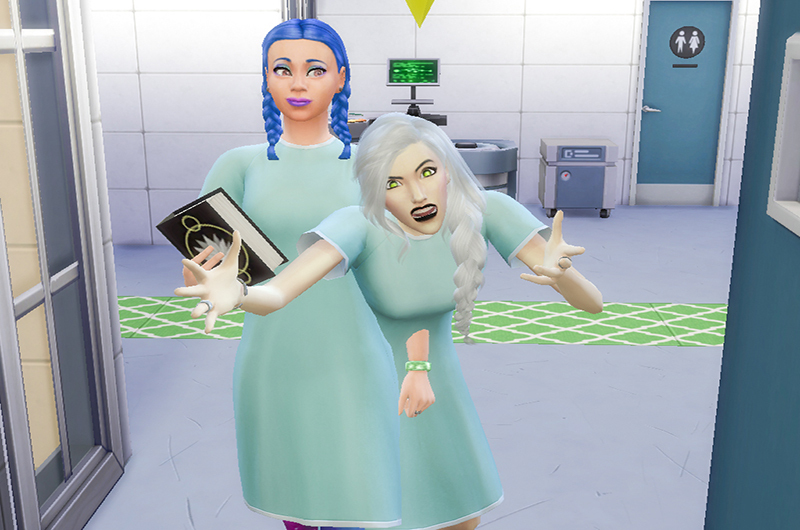 Talk about invading some personal space, these patients have no decency. And this Asylum readers is where I’ll conclude our chapter. 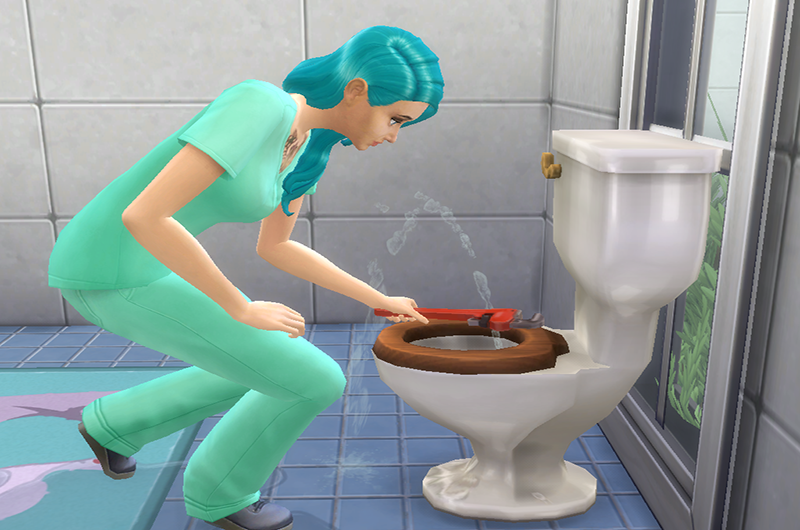 Will my Sims ever learn to use a toilet, or will they just keep wetting themselves until someone dies of embarrassment? Or will Raphael manage to burn the house down? So many potential disasters, but hey I like to live life on the edge. Thank you so much glad you’re enjoying it! 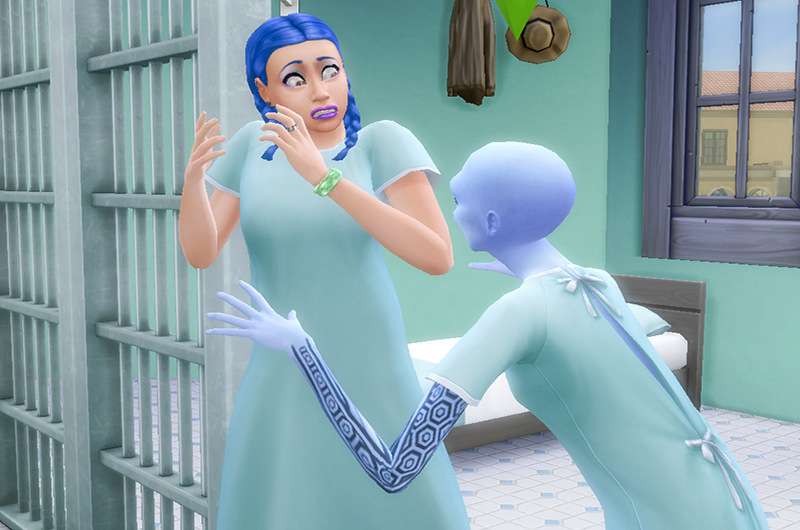 Haha, let me know how well you do with your challenge when its done 🙂 Any Sim deaths yet? 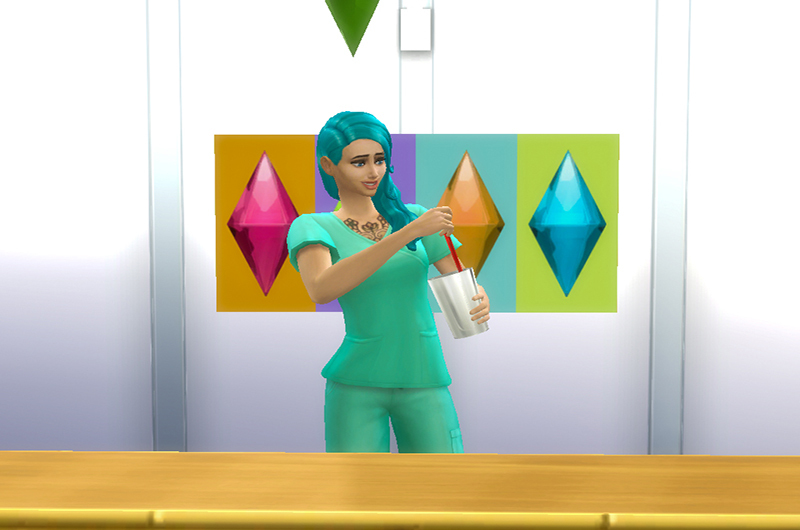 I was going to do it at the hard level, but I’m halfway through third aspiration and already everyone in the house despises each other and throw drinks in each other faces all the time!! Believe it or not but no deaths which surprises me. 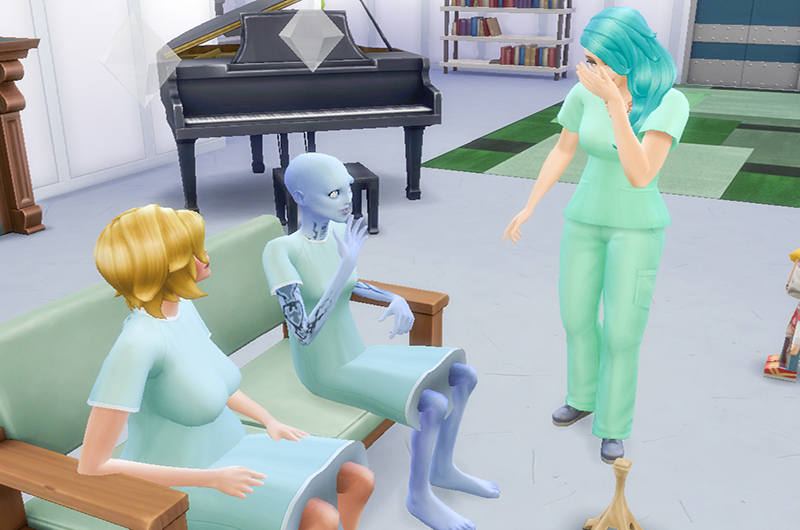 I’ve decided to now do it at the medium level and when my sim completes her third aspiration I’m going to give them all back a life 🙂 I think the real challenge then will be – can you take a group of people who despise each other and make them friends. I’m going to give that a shot.